Tingle is an average, middle-aged man living in Hyrule. A divine message leads him to a magical spring where Old Man Rupee resides. A curse is placed on Tingle, forcing him to gather rupees so the way to Rupeeland can be opened. Tingle's curse ties his life directly to the amount of rupees he holds. If he runs out of rupees, Tingle will die. He can get rupees by speaking to the various villagers and completing their minigames, but the amount of money depends on how good your bartering skills are. As well as managing your finances (and life) by playing games, drawing maps and doing battles, you can also earn rupees by defeating monsters. During the boss battles, Tingle is represented by an edited sprite of the boxer from the arcade Punch-Out! !, dressed in Tingle's green outfit. When Tingle contacts Pinkle, he uses a large computer shaped like a Nintendo DS. When Pinkle contacts Tingle on the field, he pulls out the Tingle Tuner, a device shaped like the Game Boy Advance that featured in The Legend of Zelda: The Wind Waker. The fountain in the plaza depicts the classic-style Zora from The Legend of Zelda series, while statues of the modern Zoras also appear. 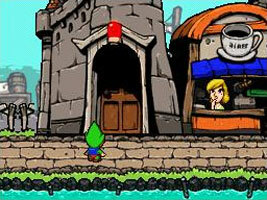 This is the second game to feature both types after The Legend of Zelda: Oracle of Ages.